Another cold foggy morning, another off-road race. After much research (i.e. 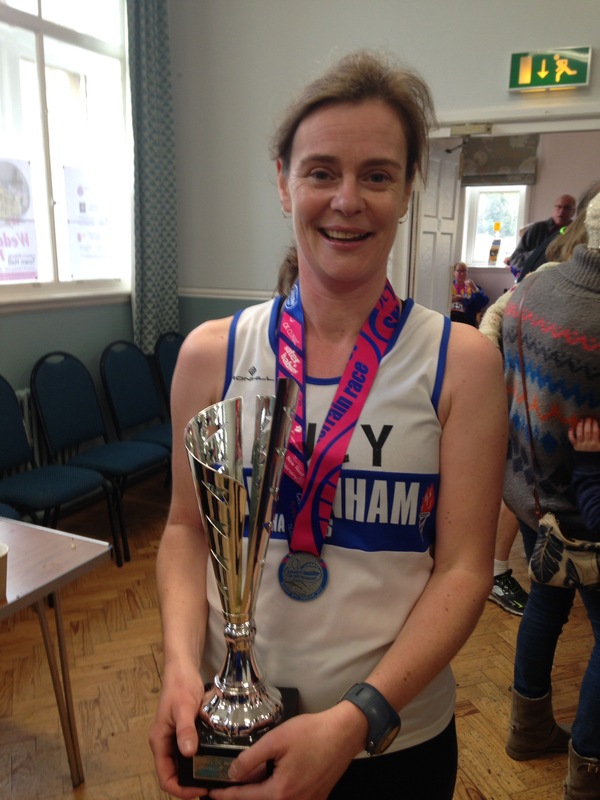 Strava stalking and run club chatting) I’d discovered this 9 mile race was actually 8 and a half and there was only one steep hill on the course (which everyone walked). So far so good. I also heard that last year someone fell into a waist-deep puddle and the farmyard at the start was a slurry-slick which one runner fell face first into after just a few hundred metres. Not so lovely. 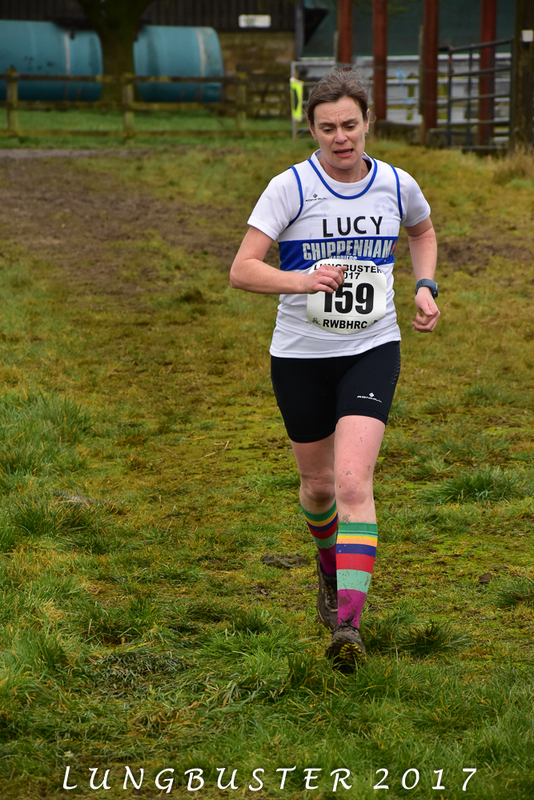 The reality was a wet farmyard but no slurry and on the course sticky, slide-y but not waist-deep mud. The pre-race briefing surprised us with the news that this year’s race was a new course which was 9 and a half miles long and sent us up “the hill” twice. With this joyous news still ringing in our ears (or it could have been the noise of numerous sets of teeth chattering and knees knocking) we set off. At the start. Running and smiling. The route didn’t sound thrilling, mostly around the edges of fields, but in reality it was lovely. We started in fog, but by the second loop this had lifted and we could see views right over Wiltshire which emphasised how high we were. 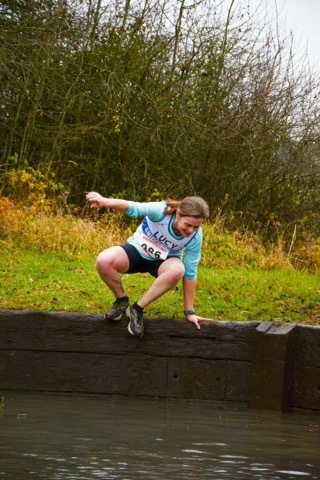 We ran on a mixture of concrete farm tracks, fields, woodland and paths – the woodland was beautiful and I would run through there again in an instant. The hill was steep and short, but everyone walked up it to the loud encouragement of a marshal. I say encouragement, it was part heckling, part harassing, and mainly shouting. How she had any voice left for the second loop I don’t know. The hill. Walking but still smiling. By the second loop, I needed every once of help I could get. Around mile 7 I got a stitch, caused by scoffing a veggie Percy Pig and then glugging my water too fast. I had a little walk and stretch to ease it out, but after that my legs just said “No”. They’d had enough, but there was still 2 and a half miles to the finish, so I just had to pull up my big girl pants and get on with it. At the finish. Running again, but no longer smiling. These were some of the hardest race miles I’ve ever run. You know that bit in a marathon where you just have to ignore what your legs are telling you, and get them moving automatically? Well that’s what these miles were like. Of course I finished, but phew was I glad to see the finish line, and also the cakes back in the village hall. Oh and the medal! Off road races seem to pride themselves on how low key they are. No goody bag at the end for these bad boys (and girls)! Just a cup of puddle water and if you’re lucky you can buy some cake. 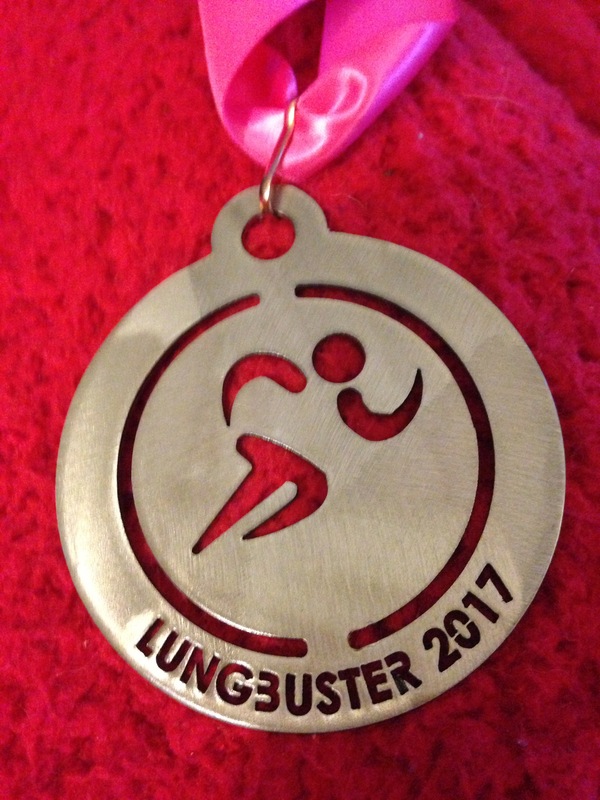 At the end of Lungbuster, as I staggered over the finish line unable to even smile, a lovely lady put this gorgeous hunk of metal around my neck. I’ll even forgive them the pink ribbon. In other news, the running club that put on this race must have the longest name of any running club. 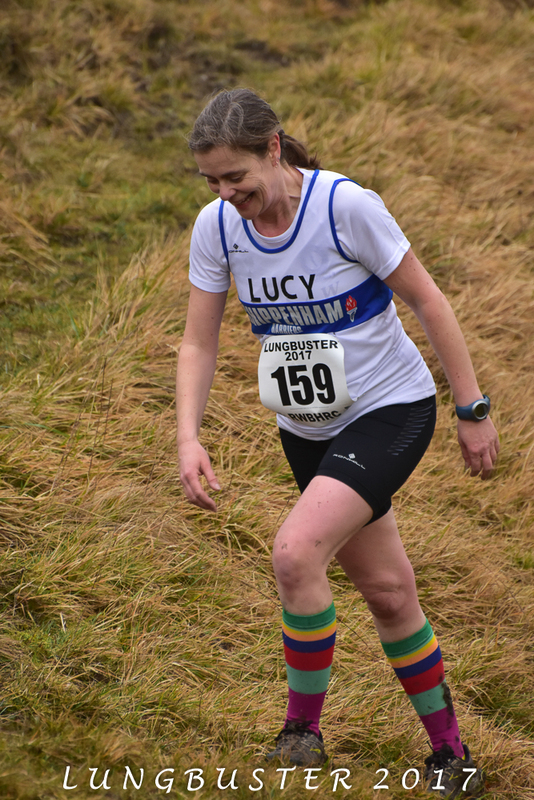 Just have a look at my race number – the random letters on the bottom are the initials of the club, the “Royal Wootton Basset Hounds Runing Club”. 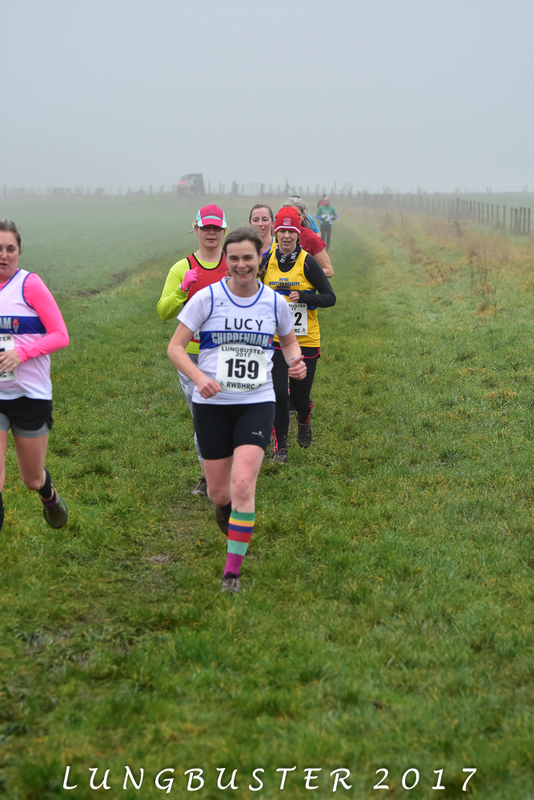 In summary, a really good race with great marshals and a good varied route, but it is a proper hard off road race so make sure you’ve done some long runs beforehand.